Welcome to Post-weekend Poetry and the thirty-first poem in this series. This week’s piece is by Alison Strange-Green. Of what had never been? to never right the wrong? The poem “lies” was inspired by actual events. The poet was caught up in a web of deceit and lies. Finding her self in a position where by legally she was unable to expose the truth. Reeling from her anger and disgust at the out come of the situation she penned the poem “Lies”. It reveals the ugliness of human nature and lengths a person will go to achieve their ultimate goal of misguided revenge. Completely disregarding thoughts and feelings of others. Showing no remorse for the consequences of their actions. Destroying families and communities forever. A deeply personal and thought provoking piece of poetry as life seen through the eyes of the poet Alison Strange-Green. Alison Strange–Green was born during the 1970s in the sleepy coal mining community of Caerphilly, South Wales. Her early childhood memories mostly consist of life in the nearby village of Ystrad Mynach, where she attended the local girl’s school, until her family uprooted and moved to nearby Blackwood. Being an only child and finding it hard to adjust, she led a solitary existence initially, spending hours absorbed in her own imagination and thoughts. During this time she first explored her unique creative nature. Slowly gaining confidence she made friends with ease, although still a very introspective and shy creature. An above average student at school, she provided more enthusiasm than talent in most subjects. It was only during her later years that the emphasis of education was realised, resulting in many academic achievements during her 20s. Unfortunately, a complex neurological condition was then diagnosed and work seemed unlikely. This however only excelled Alison’s thirst for knowledge. Longing for the acceptance of her peers she moved out of the family home in the late 80’s, only to return a few years later more confident and self-adjusted. Her more creative nature was in full flow, as was the poetry and short stories she had begun to write. During the winter of 1993 she made a life-changing decision. 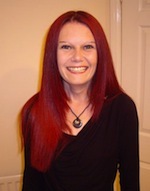 Without warning she moved to Wigan, Lancashire at the tender age of 23, where she continued her combined Honours Degree in Sociology, Psychology and Forensic Psychology at UCLAN. She also established and managed a mental health unit for several years, which was both inspiring and rewarding. As quickly as she arrived she left Lancashire. Even after 15 years she yearned to return to her native Wales. Wales often being the inspiration for many verses. Soon after returning home she married and is now happily surrounded by her family, husband Michael, Alexander 6 years and Isabella 10 months in Newport, South Wales. 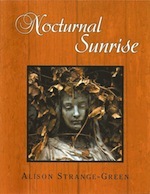 Alison’s creative streak shines throughout “Nocturnal Sunrise” displaying her own thoughts and imagination laid bare. Her website is www.strange-green.com. The blog interviews will return as normal tomorrow with novelist and short story author Marc Nash – the four hundred and fortieth of my blog interviews with novelists, poets, short story authors, bloggers, biographers, agents, publishers and more. A list of interviewees (blogged and scheduled) can be found here. If you like what you read, please do go and investigate further. And I enjoy hearing from readers of my blog; do either leave a comment on the relevant interview (the interviewees love to hear from you too!) and / or email me. What an excellent blog you have, so glad to have found you. I really like what you’re doing and accomplishing here, well done. I will enjoy following you! :*) Thank you very much, Penny… welcome to the slightly-madhouse!